The latest alarm signal that the US economy is on collision course with a recession came after today's release of the latest Senior Loan Officer Opinion Survey (SLOOS) by the Federal Reserve, which was conducted for bank lending activity during the fourth quarter of last year, and which reported a double whammy of tightening lending standards and terms for commercial and industrial loans on one hand, and weaker demand for those loans on the other. Even more concerning is that banks also reported weaker demand for both commercial and residential real estate loans, echoing the softer housing data in recent months. 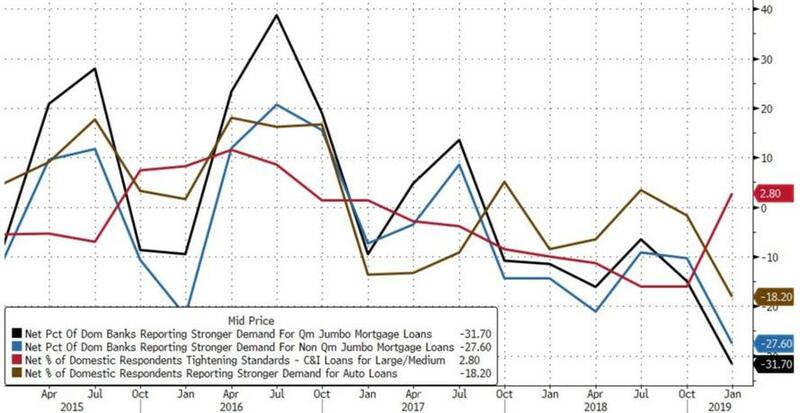 This tightening in C&I lending standards coupled with sharp declines loan demand, especially for mortgage and auto loans, is shown below. 20% of banks surveyed reportedly widened spreads of loan rates over the cost of funds for large- and medium-sized firms, while 16% narrowed spreads. 14% of banks surveyed reported higher premiums charged on riskier loans, while 4% reported lower premiums. Other terms, such as loan covenants and collateralization requirements, remained largely unchanged. Demand for loans reportedly weakened on balance. Relative to the last survey, standards on commercial real estate (CRE) loans tightened on net over the fourth quarter of the year. On net, 17% of banks reported tightening credit standards on loans secured by multifamily residential properties, while 13% of banks on net reported tightening standards for construction and land development loans. As above, banks reported that demand for CRE loans across a broad range of categories moderately weakened on net. Banks reported that lending standards for residential mortgage loans remained largely unchanged on net in 2018Q4 relative to the prior quarter. However, this benign environment was largely as a result of slumping demand for credit, as banks reported weaker demand across all surveyed residential loan categories, including home equity lines of credit. While banks reported that lending standards on consumer installment loans and autos remained largely unchanged, banks reported that lending standards for credit cards had tightened slightly. 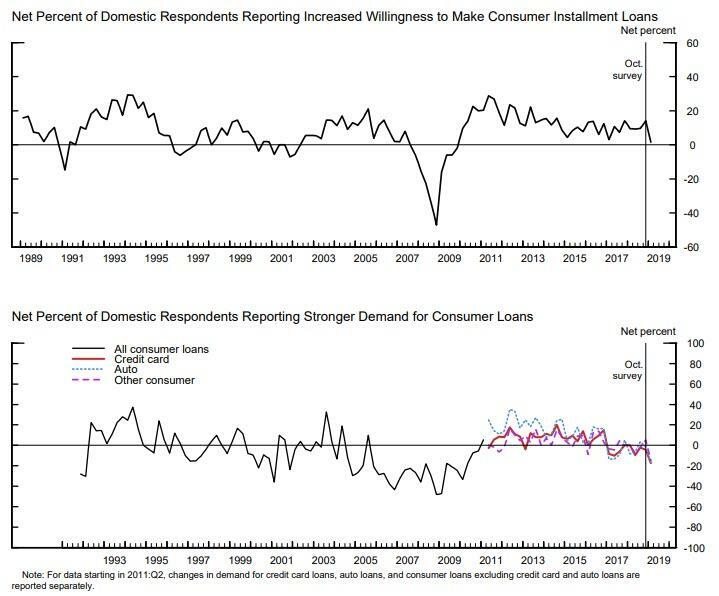 Here too demand - for all categories of consumer loans - was moderately weaker, while respondent willingness to make consumer installment loans tumbled to the lowest value since the financial crisis. Finally, and most concerning of all, is that in their response to special questions on their 2019 outlook, assuming that economic activity continues to be in line with consensus forecasts, banks reported they plan to tighten lending standards somewhat for C&I loans, commercial real estate loans, and residential mortgage loans, in other words the most important credit would become even more difficult to attain. As a result, or perhaps due to the slowdown in the economy, banks also expect demand for C&I, CRE, and residential mortgage loans to weaken somewhat in 2019. Banks also reported expecting delinquencies and charge-offs to increase somewhat on C&I, CRE, and residential mortgage loans; as Bloomberg's Andrew Cinko muses "if America was heading toward an economic contraction that would be a typical expectation. But this doesn't seem to be the case for the foreseeable future. So what gives?" Perhaps "what gives" is that the economy is not nearly as strong as consensus would make it appear, and behind closed door, loan officers are already batting down the hatches and preparing for a recession. Here would be a good time to remind readers that according to a Reuters investigation conducted in mid-December, when looking behind headline numbers showing healthy loan books, "problems appear to be cropping up in areas such as home-equity lines of credit, commercial real estate and credit cards" according to federal data reviewed by the wire service and interviews with bank execs. First, nearly half of the applications from customers with low credit scores were rejected in the four months ending in October, compared with 43 percent in the year-ago period, according to a survey released by the Federal Reserve Bank of New York. Second, banks shuttered 7 percent of existing accounts, particularly among subprime borrowers, the highest rate since the Fed started conducting surveys in 2013. Third, home-equity lines of credit declined 8 percent across the industry, with growth slowing in areas such as credit cards and commercial-and-industrial loans, the survey showed. Then there are the bank-specific signs, starting with Capital One - one of the biggest U.S. card lenders - which is restricting how much it lends to each customer even as it aggressively recruits new ones, CEO Richard Fairbank said last December. We have been more cautious in the extension of credit, initial credit lines, the broad-based credit line increase programs," he said. "At this point in the cycle, we’re going to hold back on that option a bit." Regional banks have become more cautious lately as well, as they avoid financing riskier projects like early-stage construction loans and properties without pre-lease agreements (here traders vividly recall the OZK commercial real estate repricing fiasco that sent the stock crashing). New Jersey’s OceanFirst Bank also pulled back on refinancing transactions that let customers cash out on their debt, and has started reducing exposure to industrial loans, CEO Chris Maher told Reuters. While a recession is looking increasingly likely, especially as it becomes a self-fulfilling prophecy with banks slashing loans resulting in even slower velocity of money, while demand for credit shrinks in response to tighter loan standards and hitting economic growth, the only question whether a recession is a 2019 or 2020 event, bankers and analysts remain optimistic that the next recession will look much more like the 2001 tech bubble bursting than the 2007-09 global financial crisis. We disagree, and as evidence we present Exhibit A: the shock write down that Bank OZK took on its commercial real estate, which nobody in the market had expected. As for banks being more "solid", let's remove the $1.5 trillion buffer in excess reserves that provides an ocean of artificial liquidity, and see just how stable banks are then. After all, it is this $1.5 trillion in excess reserves that prompt Powell to capitulate and tell the markets he is willing to slowdown or even pause the Fed's balance sheet shrinkage.